Over 50 leaders of Islamic and Jewish communities from across Europe met in Brussels on Monday for the first Gathering of European Muslim and Jewish Leaders to discuss initiatives for better relations between the two communities. The meeting was co-organized by the New York-based Foundation for Ethnic Understanding (FFEU), the World Jewish Congress (WJC) and the European Jewish Congress (EJC). As part of the gathering, a joint delegation met with the president of the European Council, Herman Van Rompuy, who supported the efforts undertaken by the group and called for a "revolution by the moderates." The leaders also attended a working lunch with representatives of European Commission President Jos? Manuel Barroso, at the Commission's Brussels headquarters. Senior representatives of both faiths from Austria, Belgium, Britain, France, Germany, Italy, the Netherlands, Switzerland and the United States attended the one-day gathering. The group discussed a common statement which calls for closer cooperation between the two communities in Europe and steps "to ensure that Jews and Muslims are able to practice our respective faiths fully and unimpeded by intrusive, discriminatory and unfair governmental regulations." It urges "cooperative projects to succor the poor and homeless of all backgrounds, to help protect new immigrants who are threatened by hatred and xenophobia, and to heal the environment, bringing together Muslim and Jewish youth for joint programming." It also denounces all forms of violence in the name of any religion or ideology. 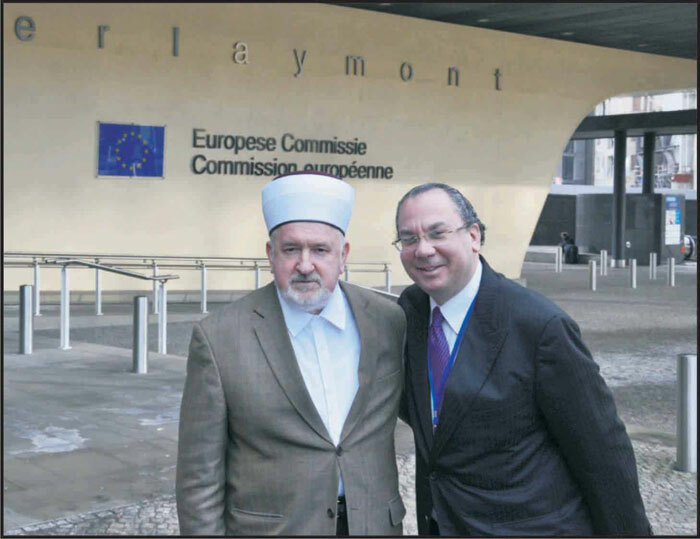 FFEU President and WJC Vice President Rabbi Marc Schneier called the first Gathering of European Muslim and Jewish leaders "a promising beginning." He stated: "Today, we have hopefully kick-started a movement that will spread across Europe. The recipe really is quite simple: our two communities must focus more on what unites us than what separates us. We also must restrain the radicals within our own ranks and make sure they don�t gain the upper hand." Moshe Kantor, president of the European Jewish Congress, declared: "I think it is very important that Jews and Muslims start talking more with each other, and less about the other. Pointing the finger at the other side and accuse it of being the root cause of all evil on this planet may be easy and convenient, but most of the time it is wrong � and counter-productive. How are all the disparate nations of Europe going to co-exist if citizens of the same country can�t share neighborhoods? We need to start at the micro level to succeed at the macro level. We need to pay attention to every level of intolerance, hate and xenophobia."